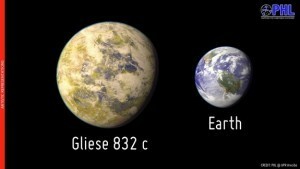 It is a planet only about twice as massive as Jupiter. While 51 Eridani b is larger than any planet in our solar system, it is currently the smallest exoplanet we’ve ever observed directly. While we’ve detected nearly 2000 planets around other stars, most of these have been discovered by methods such as transit observations, where the planet passes in front of a star causing it to dim slightly. A few were discovered using the Doppler method, where we observe the wobble of a star due to the gravitational pull of an orbiting planet. A very few have been imaged directly with powerful telescopes. Direct observation is a huge challenge. The light and heat of a star is vastly larger than that of a planet, so planets tend to be dwarfed by the light of its sun, in the way the light of a firefly is hidden by the light of a spotlight it circles. This challenge becomes easier if the planet is a large Jupiter-type planet (so that it gives off heat and radio waves) and if it is fairly distant from its star. In the case of 51 Eridani b, it orbits the star at a distance greater than Saturn orbits our Sun. While we are far from being able to image Earth-mass planets directly, direct observation of Jovian planets like this one helps us understand other planetary systems. For example, we now know that the atmosphere of 51 Eridani b contains methane, just as we find in the atmosphere of Jupiter. 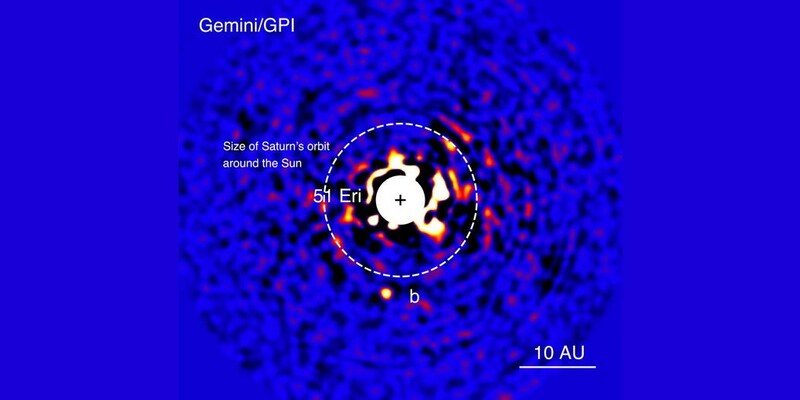 The 51 Eridani star system is only about 20 million years old, so it’s likely that planets are still forming in this system. 51 Eridani b just happens to be one of the larger ones of this system. As we study this system more, we might find clues to help us understand how our own solar system formed. How Large Can A Solar System Be? Your Firefly metaphor is not great because Fireflies produce their own light, unlike planets. You could use something like “light reflected off a Moth” instead. While its true that planets do reflect light, and in the visible spectrum that’s what dominates, planets do emit light themselves. For Jovian planets, the infrared and radio emissions can be rather strong.